Milwaukee demands "Hands off Syria!" | Fight Back! 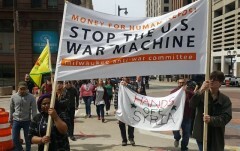 Milwaukee, WI - 40 demonstrators marched through downtown Milwaukee, April 9, in opposition to Trump’s missile attack against Syria. The action was organized by the Milwaukee Coalition Against Trump. Demonstrators from a variety of groups rallied outside of Grand Avenue mall before marching through downtown to the federal courthouse building. Attendees left the event ready to mobilize if aggressions against Syria or any other nation continues. “There was a common theme in all of our speakers today,” said Maricela Aguilar, co-chair of the Milwaukee Coalition Against Trump. “U.S. intervention in this world is a cancer that brings nothing good to this planet or its people and it must be eradicated."